Tabletop role-playing on an exotic alien world of high science-fantasy! 362 backers pledged $22,212 to help bring this project to life. Béthorm: the Plane of Tékumel RPG revives the classic Tékumel® role-playing game setting, powered by the Pocket Universe system from UNIgames' award-winning game designers! The book is projected to be 240+ pages in length, with over 70 illustrations. Look in the FAQ for a description of the game system. Very nice reviews of Pocket Universe are posted here and here. Tékumel was the first complete RPG setting ever published, in 1975's 'Empire of the Petal Throne'. My eldest brother, who introduced me to Dungeons & Dragons, bought it for us when it first came out - and I was instantly hooked. Okay, but what's the game about? Tékumel offers a whole world of adventures. Strange alien creatures prowl the wilderness. Competing clans jealously guard their business monopolies. Mighty heroes do battle in the arenas. Underground chambers hold vast treasures. Opposing temples wrestle for Imperial influence. Pirates and monsters prowl the steaming seas. Automatons guard ancient hoards of technological wonders. Imperial heirs compete for ascension to the Petal Throne. Enemy empires plot the overthrow of Tsolyánu. Hostile nonhuman races seek the destruction of Mankind. The Undying Wizards guard - and manipulate - the timeline. Nexus points open to the Demon Realms. And the Pariah Gods seek the end of existence itself! Béthorm is a skill-based system, so your character can have any combination of stats and skills you want. Béthorm offers a wide range of different fighting styles, and 20 different paths of magical study, You can implore the gods for divine intervention, and engage in spell research. You could be a soldier in an Imperial legion, a mercenary hiring your sword to the highest bidder, a member of a secret society within your temple, a sorcerer mastering ancient spells, a diplomat immersed in the dangers of foreign lands, a wealthy bravo seeking adventure, a scholar studying secrets of the ancient past... anything you desire! Béthorm isn't about just one type of adventure, because Tékumel is a world of such rich detail that any of those types of characters and storylines are possible. It's entirely up to you which themes to explore within this amazing world. For one example, check out this series of session reports from my own Béthorm campaign. For a great introduction to Tékumel, visit the tekumel.com website. When you inevitably find yourself hungry for more and bursting with questions, explore the wonderfully detailed Tékumel FAQ maintained by Brett Slocum. The Béthorm manuscript exists in a form that's been sufficient for our private use, but significant work remains to be done to refine it for publication. This will take time, and time is money. Spell Revision. Béthorm's spell list was converted directly from the previous Tékumel-based RPGs 'Swords & Glory' and 'Gardásiyal'. Playtesting has revealed that the spell list needs to be condensed and slightly re-organized for ease of gameplay. Those who've played those games may have an inkling of what I'm talking about. I'm about 1/4 of the way through that process, and my playtesters report that it is working. But I still need to complete that task, and it's a BIG spell list. Setting Information. Currently, the Béthorm RPG document generates Tékumel-appropriate characters, with all of the Tékumel-specific information you need. But it doesn't include explanations of things like what a clan is, what chlén-hide is, and so on. I still need to write simple explanations those concepts, so that a newbie can play the game without requiring all of the previously published sourcebooks. It's not our intention to duplicate all of that information in complete detail - just enough so that readers can go, "oh, I get it", and move forward. It'll be a tricky balance, and that task still remains to be completed. Final Editing: Once all of the major issues in the document have been addressed, a final editing pass will be needed to check for spelling, grammar, clarity, and so on. Page Layout: The finished document needs to be laid out in a desktop publishing program. You may add any combination of these choices to your pledge. Select any pledge level of $20 or more, while adding the following amounts to the actual amount of your pledge. For example, if you want the $20 PDF and the $8 cardboard miniatures AND the $16 signed letter-sized Pé Chói print, pledge $44 and select the $20 pledge level. I can figure out exactly what to send you using those numbers. +$1 An Excel character sheet for Béthorm. Speeds up character creation! +$2 A color PDF featuring 4 cardboard miniatures of popular nonhuman player races: the Pé Chói, Hláka, Ahoggyá and Tinalíya! +$4 A postcard-sized print of the new Tinalíya illustration by Jeff Dee! +$8: A color PDF featuring 12 different cardboard miniatures of creatures of the underworld! +$32 A set of postcard-sized prints of the 11 basic funding level illustrations PLUS any b&w illustrations that get unlocked as stretch goals! +$128 A set of signed letter-sized prints of the 11 basic funding level illustrations PLUS any b&w illustrations that get unlocked as stretch goals, signed by artist Jeff Dee! +$256 An 8 1/2" x 11" custom color portrait of the Tékumel character or creature of your choice by artist Jeff Dee, with a signed certificate of authenticity and its official Béthorm: Plane of Tékumel stats printed on a separate sheet! UNLOCKED! $10500: City of Katalál Map & Gazetteer! Everyone who pledges at least $20 gets a PDF of one mega-hex of map with descriptions of local sites from our upcoming Kurt Hill Map & Gazetteer product! Based on Prof. Barker's Northwest Frontier Map & Gazetteer (example). UNLOCKED! $11000: Introductory Adventure! Every backer who pledges $40 or more gets a PDF of "High & Dry". Disappearances from a rural farming village have thrown the clans into confusion, and delayed grain shipments. You and your companions must root out the cause and put things to rights! UNLOCKED! $11500: Adventure 2! Every backer who pledges $60 or more gets a PDF of "The Circle of Columns" (previously available as a 'system agnostic' adventure for backers of one of my art Kickstarters, this version has Béthorm-specific mechanics and a cover illustration). What secrets lie beneath this ancient circle of carven pillars? UNLOCKED! $12000: Color cover painting! The Béthorm rulebook in the video displays a color sketch of the cover painting we'd like to commission from renowned industry artist Denis Loubet. Unlocking this stretch goal also unlocks a new add-on: a signed 17" x 22" color poster of Denis's cover art, signed by the artist! UNLOCKED! $13500: More More Art: Inimical Races! UNLOCKED! $14250: Even More Art: Creatures of the Plains! UNLOCKED! $15000: Yet More Art: Forest Creatures! UNLOCKED! $15750: Even Yet Still More Art: Creatures of the Swamp & Jungle! UNLOCKED! $16500: Extreme Amounts Of Art: Desert Creatures! UNLOCKED! $17250: Ridiculous Amounts Of Art: Water Creatures! UNLOCKED! $18000: Insane Amounts Of Art: Friendly Races! UNLOCKED! 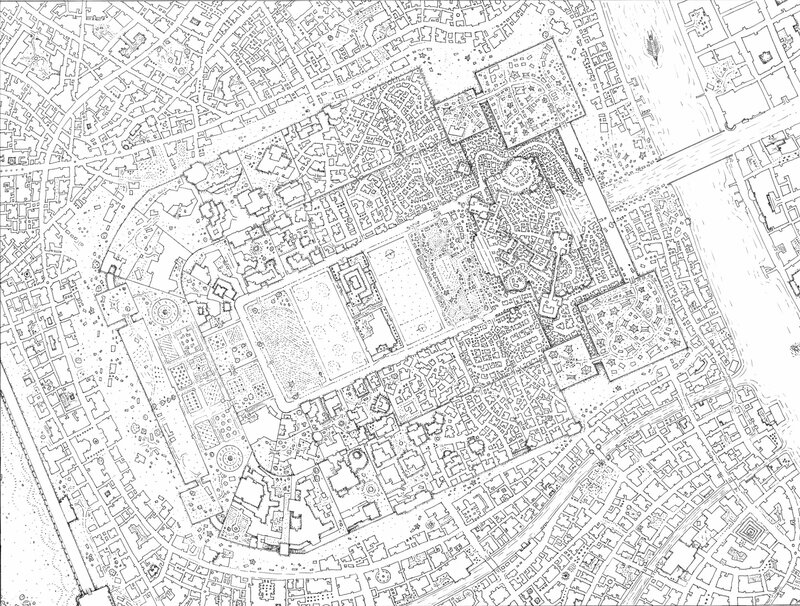 $18500: City Map: The Bethorm rulebook includes a full-page black & white map of the city of Katalal by brilliant mapmaker Alyssa Faden, plus a separate map key indicating its most important sites. BONUS! Limited Edition Glyph: Every copy of Bethorm purchased through this Kickstarter - PDF, softcover or hardcover - will contain a special glyph and the words "Special Edition" on the title page. The glyph will be specially created for this purchase by author/artist Jeff Dee, inspired by the glyphs depicted in Prof. Barker's Book of Ebon Bindings (example here). I've been involved with 3 successful role-playing game book Kickstarters and over a dozen art Kickstarters. While projects of those kinds do entail certain risks and challenges, I'm well acquainted with them and foresee no problems in those areas. What's unique about this project is that we're licensing the Tékumel setting from the Tékumel Foundation. I've relied on them to provide visual reference before, but we'll be even more dependent on them to complete a full RPG. For example, some creatures were labelled 'semi-intelligent' in earlier Tékumel RPGs, but they displayed sentience in later works. Our Pocket Universe system assigns an Intellect stat to every creature, and so we'll need a canon answer to this apparent discrepancy. If the Foundation is slow to respond, it could delay the book. BEGGING BOWL: Toss a coin into our begging bowl, and may the gods smile upon you! IMPERIAL DISPATCH: You'll receive a PDF of the Bethorm: Plane of Tekumel RPG rulebook! 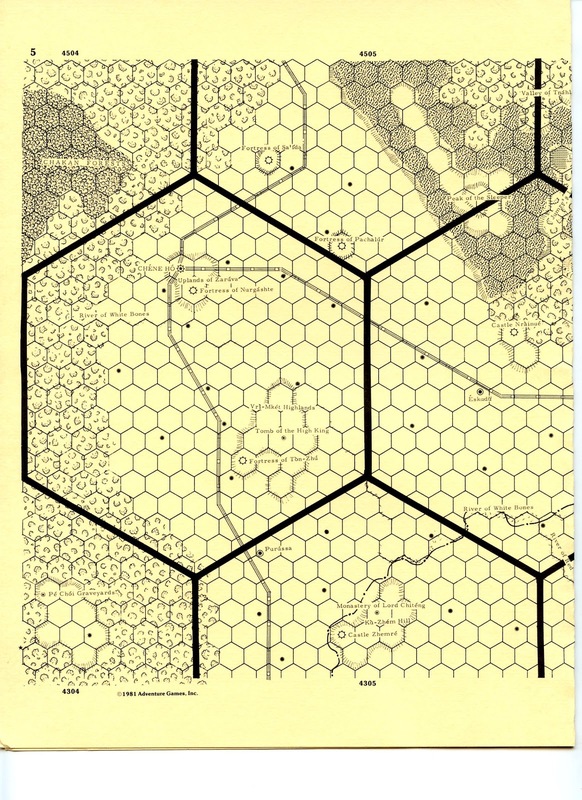 TELEPATHIC MESSAGE: You'll receive a PDF of the Bethorm: Plane of Tekumel RPG rulebook. You may take PDF and Excel add-ons, but not physical add-ons that involve shipping. EXCELLENT TRAVELLING VOLUME: You'll receive a softcover copy of the Bethorm: Plane of Tekumel rulebook, plus a PDF of same. BOOK OF MIGHTY DEEDS: You'll receive a hardcover copy of the Bethorm: Plane of Tekumel rulebook, signed by Jeff Dee, plus a PDF of same. WISE CLAN ELDER: You'll receive 3 copies of the softcover edition of the Bethorm: Plane of Tekumel rulebook, plus a PDF of same. Perfect for outfitting your entire gaming group! WEALTHY MERCHANT: For retail stores only. You'll receive 5 copies of the softcover edition of the Bethorm: Plane of Tekumel rulebook. Own the original artwork for the new drawing of the Aqá'a (the Worm of the Catacombs) - signed, and with a certificate of authenticity. Add $20 ($145 total) to also receive a PDF of the Bethorm: Plane of Tekumel rulebook, add $40 ($165 total) to also receive a softcover Bethorm rulebook, add $65 ($190 total) to also receive a signed hardcover Bethorm rulebook, or add $95 ($220 total) to also receive THREE softcover Bethorm rulebooks. Own the original artwork for the new drawing of the Ngóro (the Whelk) - signed, and with a certificate of authenticity. Add $20 ($145 total) to also receive a PDF of the Bethorm: Plane of Tekumel rulebook, add $40 ($165 total) to also receive a softcover Bethorm rulebook, add $65 ($190 total) to also receive a signed hardcover Bethorm rulebook, or add $95 ($220 total) to also receive THREE softcover Bethorm rulebooks. Own the original artwork for the new drawing of the Ngrútha (the Leech) - signed, and with a certificate of authenticity. Add $20 ($145 total) to also receive a PDF of the Bethorm: Plane of Tekumel rulebook, add $40 ($165 total) to also receive a softcover Bethorm rulebook, add $65 ($190 total) to also receive a signed softcover Bethorm rulebook, or add $95 ($220 total) to also receive THREE softcover Bethorm rulebooks. Own the original artwork for the new drawing of the Pé Chói (the Listener) - signed, and with a certificate of authenticity. Add $20 ($145 total) to also receive a PDF of the Bethorm: Plane of Tekumel rulebook, add $40 ($165 total) to also receive a signed softcover Bethorm rulebook, or add $95 ($220 total) to also receive THREE signed softcover Bethorm rulebooks. Own the original artwork for the new drawing of the Pygmy Folk - signed, and with a certificate of authenticity. Add $20 ($145 total) to also receive a PDF of the Bethorm: Plane of Tekumel rulebook, add $40 ($165 total) to also receive a signed softcover Bethorm rulebook, or add $95 ($220 total) to also receive THREE signed softcover Bethorm rulebooks. Own the original artwork for the new drawing of the Qáqtla (the Swamp Snake) - signed, and with a certificate of authenticity. Add $20 ($145 total) to also receive a PDF of the Bethorm: Plane of Tekumel rulebook, add $40 ($165 total) to also receive a softcover Bethorm rulebook, add $65 ($190 total) to also receive a signed hardcover Bethorm rulebook, or add $95 ($220 total) to also receive THREE softcover Bethorm rulebooks. Own the original artwork for the new drawing of the Swamp Folk - signed, and with a certificate of authenticity. Add $20 ($145 total) to also receive a PDF of the Bethorm: Plane of Tekumel rulebook, add $40 ($165 total) to also receive a softcover Bethorm rulebook, add $65 ($190 total) to also receive a signed hardcover Bethorm rulebook, or add $95 ($220 total) to also receive THREE softcover Bethorm rulebooks. Own the original artwork for the new drawing of the Tinalíya (the Gnome-Like One) - signed, and with a certificate of authenticity. Add $20 ($145 total) to also receive a PDF of the Bethorm: Plane of Tekumel rulebook, add $40 ($165 total) to also receive a softcover Bethorm rulebook, add $65 ($190 total) to also receive a signed softcover Bethorm rulebook, or add $95 ($220 total) to also receive THREE softcover Bethorm rulebooks. Own the original artwork for the new drawing of the Tletlákha (the Mouth With Eyes) - signed, and with a certificate of authenticity. Add $20 ($145 total) to also receive a PDF of the Bethorm: Plane of Tekumel rulebook, add $40 ($165 total) to also receive a softcover Bethorm rulebook, add $65 ($190 total) to also receive a signed hardcover Bethorm rulebook, or add $95 ($220 total) to also receive THREE softcover Bethorm rulebooks. Own the original artwork for the new drawing of the Tsóggu (the Drowned One) - signed, and with a certificate of authenticity. Add $20 ($145 total) to also receive a PDF of the Bethorm: Plane of Tekumel rulebook, add $40 ($165 total) to also receive a softcover Bethorm rulebook, add $65 ($190 total) to also receive a signed hardcover Bethorm rulebook, or add $95 ($220 total) to also receive THREE softcover Bethorm rulebooks. Own the original artwork for the new drawing of the Atlún (the Spider) - signed, and with a certificate of authenticity. Add $20 ($145 total) to also receive a PDF of the Bethorm: Plane of Tekumel rulebook, add $40 ($165 total) to also receive a softcover Bethorm rulebook, add $65 ($190 total) to also receive a signed hardcover Bethorm rulebook, or add $95 ($220 total) to also receive THREE softcover Bethorm rulebooks. Own the original artwork for the new drawing of the Jájgi (the Exalted Undead) - signed, and with a certificate of authenticity. Add $20 ($145 total) to also receive a PDF of the Bethorm: Plane of Tekumel rulebook, add $40 ($165 total) to also receive a softcover Bethorm rulebook, add $65 ($190 total) to also receive a signed hardcover Bethorm rulebook, or add $95 ($220 total) to also receive THREE softcover Bethorm rulebooks. Own the original artwork for the new drawing of the Srámuthu (the Jolly Stranger) - signed, and with a certificate of authenticity. Add $20 ($145 total) to also receive a PDF of the Bethorm: Plane of Tekumel rulebook, add $40 ($165 total) to also receive a softcover Bethorm rulebook, add $65 ($190 total) to also receive a signed hardcover Bethorm rulebook, or add $95 ($220 total) to also receive THREE softcover Bethorm rulebooks. Own the original artwork for the new drawing of the Hokún (the Glass-Monster) - signed, and with a certificate of authenticity. Add $20 ($145 total) to also receive a PDF of the Bethorm: Plane of Tekumel rulebook, add $40 ($165 total) to also receive a softcover Bethorm rulebook, add $65 ($190 total) to also receive a signed hardcover Bethorm rulebook, or add $95 ($220 total) to also receive THREE softcover Bethorm rulebooks. Own the original artwork for the new drawing of the Mihálli (the Shape-Shifter) - signed, and with a certificate of authenticity. Add $20 ($145 total) to also receive a PDF of the Bethorm: Plane of Tekumel rulebook, add $40 ($165 total) to also receive a softcover Bethorm rulebook, add $65 ($190 total) to also receive a signed hardcover Bethorm rulebook, or add $95 ($220 total) to also receive THREE softcover Bethorm rulebooks. Own the original artwork for the new drawing of the Nyaggá (the Dweller Below) - signed, and with a certificate of authenticity. Add $20 ($145 total) to also receive a PDF of the Bethorm: Plane of Tekumel rulebook, add $40 ($165 total) to also receive a softcover Bethorm rulebook, add $65 ($190 total) to also receive a signed hardcover Bethorm rulebook, or add $95 ($220 total) to also receive THREE softcover Bethorm rulebooks. Own the original artwork for the new drawing of the Kité (the Little Whirlwind) - signed, and with a certificate of authenticity. Add $20 ($145 total) to also receive a PDF of the Bethorm: Plane of Tekumel rulebook, add $40 ($165 total) to also receive a softcover Bethorm rulebook, add $65 ($190 total) to also receive a signed hardcover Bethorm rulebook, or add $95 ($220 total) to also receive THREE softcover Bethorm rulebooks. Own the original artwork for the new drawing of the Kókh (the Blood-Lizard) - signed, and with a certificate of authenticity. Add $20 ($145 total) to also receive a PDF of the Bethorm: Plane of Tekumel rulebook, add $40 ($165 total) to also receive a softcover Bethorm rulebook, add $65 ($190 total) to also receive a signed hardcover Bethorm rulebook, or add $95 ($220 total) to also receive THREE softcover Bethorm rulebooks. Own the original artwork for the new drawing of the Tlékku (the Dog) and its Tsolyani master - signed, and with a certificate of authenticity. Add $20 ($145 total) to also receive a PDF of the Bethorm: Plane of Tekumel rulebook, add $40 ($165 total) to also receive a softcover Bethorm rulebook, add $65 ($190 total) to also receive a signed hardcover Bethorm rulebook, or add $95 ($220 total) to also receive THREE softcover Bethorm rulebooks. Own the original artwork for the new drawing of the Dlikkén (the One Who Is Many) - signed, and with a certificate of authenticity. Add $20 ($145 total) to also receive a PDF of the Bethorm: Plane of Tekumel rulebook, add $40 ($165 total) to also receive a softcover Bethorm rulebook, add $65 ($190 total) to also receive a signed hardcover Bethorm rulebook, or add $95 ($220 total) to also receive THREE softcover Bethorm rulebooks. Own the original artwork for the new drawing of the Nráishu (the Night Stag) - signed, and with a certificate of authenticity. Add $20 ($145 total) to also receive a PDF of the Bethorm: Plane of Tekumel rulebook, add $40 ($165 total) to also receive a softcover Bethorm rulebook, add $65 ($190 total) to also receive a signed hardcover Bethorm rulebook, or add $95 ($220 total) to also receive THREE softcover Bethorm rulebooks. Own the original artwork for the new drawing of the Sikún (the Little Men) - signed, and with a certificate of authenticity. Add $20 ($145 total) to also receive a PDF of the Bethorm: Plane of Tekumel rulebook, add $40 ($165 total) to also receive a softcover Bethorm rulebook, add $65 ($190 total) to also receive a signed hardcover Bethorm rulebook, or add $95 ($220 total) to also receive THREE softcover Bethorm rulebooks. Own the original artwork for the new drawing of the Shivrái (the Drill-Bug) - signed, and with a certificate of authenticity. Add $20 ($145 total) to also receive a PDF of the Bethorm: Plane of Tekumel rulebook, add $40 ($165 total) to also receive a softcover Bethorm rulebook, add $65 ($190 total) to also receive a signed hardcover Bethorm rulebook, or add $95 ($220 total) to also receive THREE softcover Bethorm rulebooks. Own the original artwork for the new drawing of the Hlu'ún (the Lost Child) - signed, and with a certificate of authenticity. Add $20 ($145 total) to also receive a PDF of the Bethorm: Plane of Tekumel rulebook, add $40 ($165 total) to also receive a softcover Bethorm rulebook, add $65 ($190 total) to also receive a signed hardcover Bethorm rulebook, or add $95 ($220 total) to also receive THREE softcover Bethorm rulebooks. Own the original artwork for the new drawing of the Chnáu (the Swift Viper) - signed, and with a certificate of authenticity. Add $20 ($145 total) to also receive a PDF of the Bethorm: Plane of Tekumel rulebook, add $40 ($165 total) to also receive a softcover Bethorm rulebook, add $65 ($190 total) to also receive a signed hardcover Bethorm rulebook, or add $95 ($220 total) to also receive THREE softcover Bethorm rulebooks. Own the original artwork for the new drawing of the Epéng (the Snake-Like Colony) - signed, and with a certificate of authenticity. Add $20 ($145 total) to also receive a PDF of the Bethorm: Plane of Tekumel rulebook, add $40 ($165 total) to also receive a softcover Bethorm rulebook, add $65 ($190 total) to also receive a signed hardcover Bethorm rulebook, or add $95 ($220 total) to also receive THREE softcover Bethorm rulebooks. Own the original artwork for the new drawing of the Míku (the Armored Lizard) - signed, and with a certificate of authenticity. Add $20 ($145 total) to also receive a PDF of the Bethorm: Plane of Tekumel rulebook, add $40 ($165 total) to also receive a softcover Bethorm rulebook, add $65 ($190 total) to also receive a signed hardcover Bethorm rulebook, or add $95 ($220 total) to also receive THREE softcover Bethorm rulebooks. Own the original artwork for the new drawing of the Utánakh (the Hidden Spear) - signed, and with a certificate of authenticity. Add $20 ($145 total) to also receive a PDF of the Bethorm: Plane of Tekumel rulebook, add $40 ($165 total) to also receive a softcover Bethorm rulebook, add $65 ($190 total) to also receive a signed hardcover Bethorm rulebook, or add $95 ($220 total) to also receive THREE softcover Bethorm rulebooks. Own the original artwork for the new drawing of the Étla (the Crab) - signed, and with a certificate of authenticity. Add $20 ($145 total) to also receive a PDF of the Bethorm: Plane of Tekumel rulebook, add $40 ($165 total) to also receive a softcover Bethorm rulebook, add $65 ($190 total) to also receive a signed hardcover Bethorm rulebook, or add $95 ($220 total) to also receive THREE softcover Bethorm rulebooks. Own the original artwork for the new drawing of the Kátru (the Clam) - signed, and with a certificate of authenticity. Add $20 ($145 total) to also receive a PDF of the Bethorm: Plane of Tekumel rulebook, add $40 ($165 total) to also receive a softcover Bethorm rulebook, add $65 ($190 total) to also receive a signed hardcover Bethorm rulebook, or add $95 ($220 total) to also receive THREE softcover Bethorm rulebooks. Own the original artwork for the new drawing of the Zo'óra (the God of the Deep) - signed, and with a certificate of authenticity. Add $20 ($145 total) to also receive a PDF of the Bethorm: Plane of Tekumel rulebook, add $40 ($165 total) to also receive a softcover Bethorm rulebook, add $65 ($190 total) to also receive a signed hardcover Bethorm rulebook, or add $95 ($220 total) to also receive THREE softcover Bethorm rulebooks. WEALTHY MERCHANT OF THE GODS: For retail stores only. You'll receive 5 copies of the hardcover edition of the Bethorm: Plane of Tekumel rulebook. VIRTUAL VISITATION: Jeff Dee will run a 4-hour Bethorm session for you and up to 5 of your friends online, using the Roll20 app in a Google+ hangout. Must be redeemed by August 2015. Add $20 ($220 total) to also receive a PDF of the Bethorm: Plane of Tekumel rulebook, add $40 ($240 total) to also receive a signed softcover Bethorm rulebook, or add $95 ($295 total) to also receive THREE signed softcover Bethorm rulebooks. PHYSICAL MANIFESTATION: Jeff Dee will run a 4-hour Bethorm session for you and up to 5 of your friends at any game convention where he is already scheduled as a guest. Watch here for convention dates: http://unigames.us/?page_id=59 Must be redeemed by August 2015. Add $20 ($220 total) to also receive a PDF of the Bethorm: Plane of Tekumel rulebook, add $40 ($240 total) to also receive a signed softcover Bethorm rulebook, or add $95 ($295 total) to also receive THREE signed softcover Bethorm rulebooks. THUNDERING CARAVAN: For retail stores only. You'll receive 10 copies of the softcover edition of the Bethorm: Plane of Tekumel rulebook. THUNDERING CARAVAN OF THE GODS: For retail stores only. You'll receive 10 copies of the hardcover edition of the Bethorm: Plane of Tekumel rulebook. VISITATION OF GLORY: Jeff Dee will run a 4-hour Bethorm session for you and up to 5 of your friends at any North American game convention of your choice. Must be redeemed by August 2015. Add $20 ($770 total) to also receive a PDF of the Bethorm: Plane of Tekumel rulebook, add $40 ($790 total) to also receive a signed softcover Bethorm rulebook, or add $95 ($845 total) to also receive THREE signed softcover Bethorm rulebooks. Please add $10 for shipping if you're having any physical rewards shipped outside the US.